SugarSpiceStyle: Out with the old...out with the new? I hate to be a negative Nancy, but every once and a while there's a trend that urges me to ask, "What are people thinking? Do people really like this?" Of course, this distaste of mine for certain trends is based solely on my opinion. And I know there have been plenty of times when I have been challenged for my taste (in college, I had a gorgeous turquoise fur jacket, but my friends didn't think it was so phenomenal; they called me Sully from the movie Monster, Inc. At the same time, I don't think they know what haute couture even means...). What this all boils down to is that I am in no position to critique trends. But I'm going to anyways. I have seen this "evil eye" on cheap jewelry and nicer, designer jewelry. Really? I have no argument with this. It's like trying to argue with someone who is thinking illogically and who's argument isn't based in any reason or logic and it's impossible to show the person how illogical their argument is because the person isn't thinking rationally. I don't care which designers endorse this, I think it's hideous, and there are plenty of other symmetrical symbols to plaster onto jewelry that are more pleasing than an eye and still have some mystical or significant quality. Since I'm on my soap box, I might as well get the ewww out of my system in regards to the return of bell-bottom pants. You ready? Ewwwwwwwww! I'm completely fine with the flare leg that starts at the waste and just has a nice clean line--all good. But the bell-bottoms? I just don't understand it. Yes, it's been a good 16 years since bell-bottoms were all the rage. 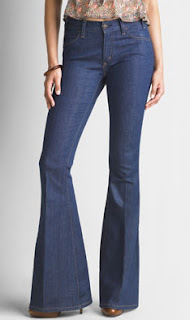 In fact, bell-bottoms were the fresh trend when I was in 6th grade and coming into my own as a budding fashion-lover. Maybe it's because bell-bottoms were part of such a pivotal time in my own fashion timeline and that association is so strong for me that I have such a distaste for them now. Maybe I dislike them because for the past 10 years when they haven't been in style, people have been wearing them anyways. But, again, who am I to judge? I'm a die-hard fan of my skinny jeans and would wear them if it meant giving up my first-born. Bottom line: bell-bottoms don't do it for me. Lastly, animal-skin/fur pattern is not a trend. Trends come and go; animal-skin print has been fashionable for more than the past decade. I do not want to see this on another trend list! I look at trend lists for inspiration and something new. Let's just agree that animal skin prints are awesome and here to stay until someone makes an announcement that it's the Devil on Earth (in which case we can continue to wear it because, well, it's just that awesome). 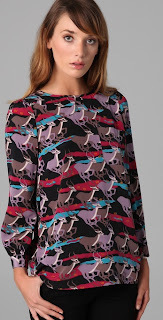 That being said, relish your animal-skin prints, and welcome the novelty of animals used for patterns or prints (as Marc Jacobs has with the above top). And when you see animal-skin patterns on a trend list, just shake your head and challenge yourself to come up with your own creative and original twist for fashion! I feel much better since I have that off my chest. I am curious whether the majority of people follow trends because they like them or because they are solely what's "popular." Style is not about following or resisting what's in fashion. To have your own style takes confidence, personality, opinion, and hopefully risks. I'd like to think of my own style as having a solid, static foundation while at the same time as something that's in process and growing--and growth never happens without exploration and risk. You win some; you lose some. Going through your closet is sort of like reflecting on your life; there are things you love, a couple crazy pieces, items that were good while they lasted, some what-the-hell-was-I-thinking items, and also those pieces that will make their way into the next round. Have you ever heard your mom talk about that pair of jeans she can still fit into from high school? Everyone needs to decide which items are their "bell-bottoms" and which items are their animal prints, whether you're looking at your wardrobe or your life.